For most parents, this news can be both alarming and confusing, especially when a child appears to be both healthy and active at the time of diagnosis. Clearly, routine spinal screenings have done much to increase the population’s awareness of scoliosis in general, but serious questions rarely arise until a parent discovers that his or her child may have the disorder. From time to time, NSF receives inquiries about a condition called flat back syndrome. To find out more about it, Nancy Schommer recently interviewed Michael LaGrone, MD, a scoliosis specialist who has a private practice in Amarillo, Texas. Dr. LaGrone is a member of the Scoliosis Research Society and a medical advisor to the NSF. He is also a member of the clinical faculty of the Texas Tech University Health Science Center. Every year, the National Scoliosis Foundation receives queries about rib thoracoplasty, a surgical technique sometimes used to help patients with scoliosis who also suffer from a “rib hump”. To find out more about the procedure, NSF asked Dr. Serena S. Hu, Assistant Professor, Department of Orthopaedic Surgery at the University of California, to respond to a number of questions. What follows are excerpts of her responses, which have been edited by Nancy Schommer, author of Stopping Scoliosis. Because the National Scoliosis Foundation receives constant inquiries from individuals asking whether pain is a symptom of idiopathic scoliosis, we interviewed Dr. Robert Winter, internationally know for work in surgical and non-surgical treatment of spine deformity. Dr. Winter is the author of numerous textbooks, papers, and chapters of surgical textbooks. He is a frequent speaker at national and international orthopaedics conferences. He is also a founding member and past president of the Scoliosis Research Society, President of the Minnesota Spine Center, Chief of Spine Service at Gillette Children’s Hospital, and Clinical Professor of Orthopaedic Surgery at the University of Minnesota. Many adults with scoliosis, including those with prior corrective surgery, are curious about the risks and benefits of exercises and sports participation. In our experiences, most adults with scoliosis have never held discussions with medical professionals about these issues. Research based information about therapeutic or recreational exercise for adults with scoliosis is lacking. The advice expressed in this article will therefore reflect experiences described to us by our patients with scoliosis, and our recommendations to these patients. Can exercise correct or stop the progression of the scoliosis curve? Are recreational exercise and sports participation advised? In this article, we will present some of the advantages and limitations of exercise for adolescents with scoliosis. Adults with scoliosis, including those with corrective surgeries, often also seek advice about exercises, especially if they begin experiencing discomfort and stiffness in their backs. Therapeutic and recreational exercise for adults will be presented in a future article. The word “chiropractic” is a compilation of two Greek words which are interpreted to mean “efficient hands”. In 1898 David Daniel Palmer, the originator of chiropractic, set up the Palmer College of Chiropractic in Davenport, Iowa. Today, there are fifteen accredited institutions and programs in the US offering the Doctor of Chiropractic (DC) degree. Following is an explanation of the nature, practice, and basic theories of chiropractic as defined by the Council of Chiropractic Education, and the Massachusetts Chiropractic Society. Throughout history man has tried to straighten out that which nature has bent, twisted, or curved. Hippocrates not only gave a name to scoliosis but he also tried to correct it. Over the centuries since then physicians have used a wide, and sometimes strange, variety of devices to straighten a crooked spine. 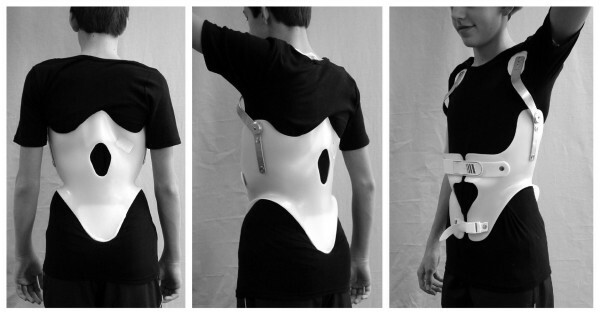 In today’s world when a growing adolescent is diagnosed with progressive idiopathic scoliosis and the curve is between 25 and 40 degrees, the physician will prescribe the wearing of a brace to keep the curve from worsening. Depending on the severity of the curve, the curve pattern, and the amount of growth remaining, the physician may not wait to document progression but will prescribe bracing on the initial visit. Every year, the National Scoliosis Foundation receives letters and telephone calls from parents of young people who have been told they have a “mild” curvature of the spine. They are concerned and confused. They have been told that treatment is not presently necessary but may be in the future. Parents ask us, “are we to just stand by and watch our child become deformed?” To find out more about such curves, we interviewed Dr. William P. Bunnell, Chairman of the Department of Orthopaedic Surgery, Loma Linda University Medical Center, Loma Linda, California.